Thank you for your inquiry. I have attached an image of your steerer. When the brake appears to be not functioning, the natural tendency is to turn the center knob using more force. This can be damaging. Just forward of the sprocket, there is a stainless washer and snap ring that sets in to a machined groove in the steering wheel shaft. They may have been distorted or dislodged. They should be reset and may require loosening the set screws securing the sprocket. The recommended fix is to install a 2 piece stainless shaft collar tight against the sprocket. It is # 960-A-2715 available @ $74.00. It can be ordered direct with our customer service @ (508) 995-9711. This should correct the brake issue. Also it is important to tighten the 4 nuts and socket cap screws located in back of the mounting plate. 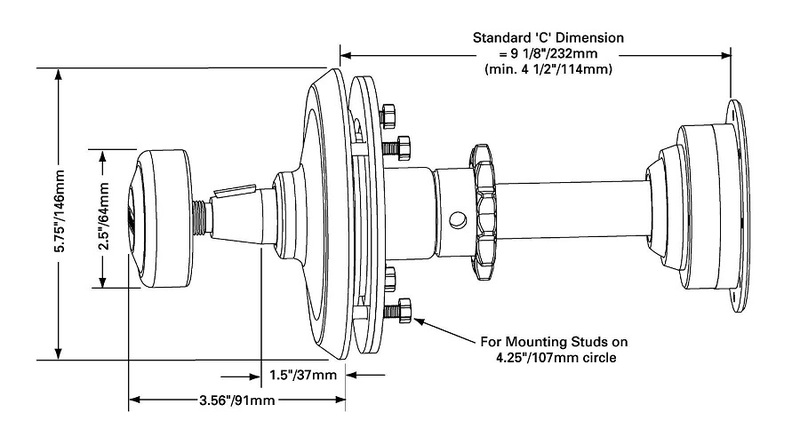 The recommended replacement for the nut securing the steering wheel is a 5/8-18” Nyloc. Mention it when you place your order and we will gladly send one along at no charge. This is from their website, unsure if it is the same wheel shaft. If you call Edson (508) 995-9711 their tech support is very good. I did that when I needed to find info about the friction lock that I posted above. Post here what you find out. I did this repair and picked up a 1" stainless shaft collar from McMaster Carr. They stock them in 303 SS for around $18 and in 316 SS for around $35. You might need to reseat the snap ring before installing the collar.